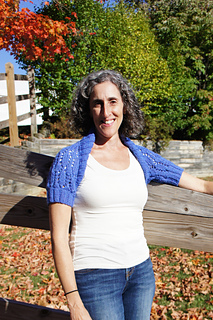 This easy shrug is knit cuff to cuff. 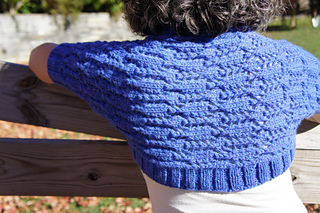 Stitches are picked up around the edge and short rows are used to shape the shawl collar. 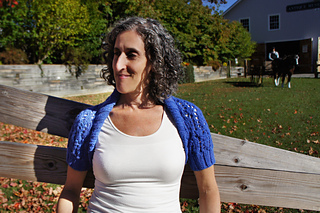 Toss it on over a sun dress, or t-shirt. Dress it up or down, it will keep the chill away. 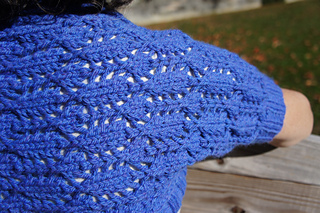 13 3/4 stitches and 18 3/4 rows = 4”/10cm in Nesting Diamond Lace on US 8 TAKE TIME TO CHECK GAUGE.